This room can share the bath with the Granaio. 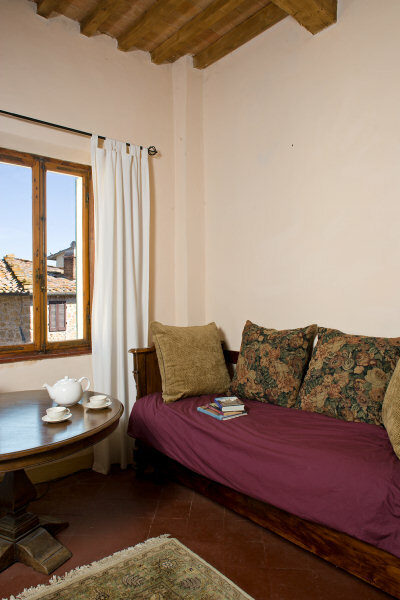 The twin beds were made from the footboards of the big carved wooden beds (Antico and Giardino). The mattresses themselves and their frames are the same quality as all the other beds, newly hand-made in Torrita di Siena, nearby. 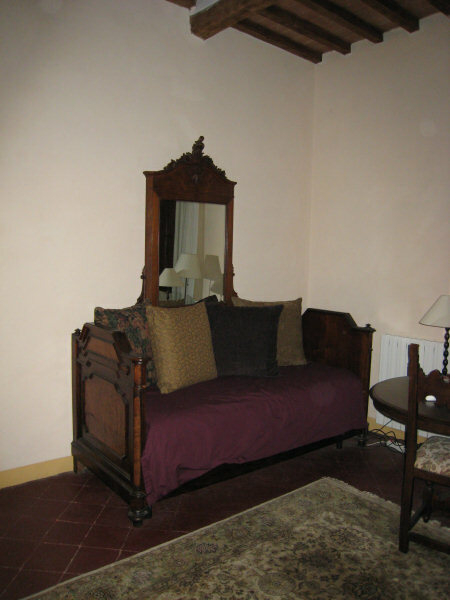 The original beds were made in Umbria and other antique pieces, the drop leaf table and the dressing table, were purchased in Rome. For families with little cousins, consider putting all three trundle beds in here for a continuous 'sleepover.' The kids can use parents' baths. This is also where I keep travel books, novels and maps. (All of the cookbooks are in the liberia (closed book cabinet) behind the couch in the living room, left hand door.) Help yourself to the books and maps, in the big book cabinet, left side and on the shelves, but please return things when you are finished. Many people add their 'airplane books', so there are thrillers and novels, here too. Madelyn's library is taking up residency here, too, this summer (2008) so there will be an assortment of children's books to fill in the gaps. English-language children's books are hard to buy in Italy, generally.